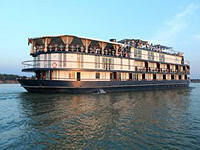 From Ho-Chi-Minh City to Siem Reap (Angkor) by River Cruise. Arriving Ho Chi Minh City, our local representative will be at the airport to welcome you & transfer to your hotel. Today city tour includes a tour of The Reunification Palace (former Presidential Palace), Post Office, Notre Dame Cathedral, Lam Son Square, Ben Thanh Market, Thien Hau pagoda, The Museum of HCM Campaign, China Town (Cholon) & Binh Tay Market etc. Enjoy a morning drive through typical southern Vietnamese countryside to Tay Ninh Province in the west of Vietnam. At Tay Ninh visit the incredible Cao Dai Great Temple, with architecture that could have come straight from a Walt Disney fantasy and where all the major faiths of the world blend together in a unique religious cocktail. In the afternoon visit the famous Cu Chi Tunnels, an underground tunnel network constructed by Vietnamese resistance fighters during the long struggle for independence. Tonight dinner at local restaurant. Morning at leisure. Afternoon we travel by land to My Tho to embark the 7 nights/8 days cruise to Cambodia. After a welcome drink, the boat will set off, gliding along the Mekong. As the sunlight fades there is a briefing in the lounge, and dinner will be served as we approach Cai Be. After breakfast this morning we will have a short excursion in Chau Doc, a pleasant town near the Cambodian border with sizeable Chinese, Kinh and Khmer communities. We will also visit the colourful local market near an ancient temple. This is followed by a trip to the quay, where we will take a boat excursion to the floating villages and rustic catfish farms trip to the quay. Then, it is back to the boat for lunch. By mid-afternoon, the cruise boat will make its way to the border on the way to Phnom Penh, the capital city of Cambodia. It is an opportune time to relax on board, sharpen your culinary skills with our hands-on cooking classes or tour the boat with our Cruise Director. Cruising along the Tonle River - an amazingly narrow river - which glides through leafy swaths of the Southeast Asian jungle. We are greeted by cacophonous children who waive enthusiastically early in the morning when they bring their livestock for to bathe the meandering River. Then we approach Kampong Chang, Cambodia’s “waterworld” where everything is on stilts balanced on water rich soil. Here take a motorboat excursion to the landing, followed by a short bus trip to see the Khmer-styled pottery at the Aundaung Russey village. Then, it is back to the river for an adventurous motorboat excursion to the wetlands, floating houses and fish farms in the region. We then return to the cruise boat for lunch, taken whilst cruising the narrow and meandering Tonle River. We will cruise towards Prek K’dam where we will take a walk through the silversmith village of Koh Chen where the entire community of villagers is involved in making various silver items for sale. Back on the boat, we cruise back towards Phnom Penh. 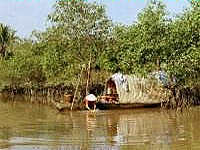 We will depart before the break of dawn from Phnom Penh with a stop at the little known Chong Koh silk weaving village. Next we will tour the rural Angkor Ban village where time has stood still. The houses here are truly rustic, made by hand and without any concrete. Afterwards, cruise onwards towards Kampong Cham. We will wake up in the small hours of the morning, to embark on a land journey to the pre-Angkorian temple Wat Hanchey. Travellers can either take a motor-taxi or climb 291 steps to the top. 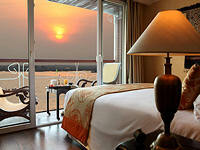 Located at the top of a hill overlooking the river, it offers one of the most breath-taking views in Cambodia. Built in the 8th century, this ancient structure, together with a bigger and newer addition underscores the superb architecture of the Chenla Empire which predates the mighty Angkor temple complex. We even get to engage in light banter with some of the monks in the area. We will return to the boat to witness a blessing ceremony performed by orange-clad local monks. When the tide allows, we will enjoy a surprise sojourn in our zodiacs (inflatable boats) to the nearby beach to swim in the Mekong River. We will then cruise towards Kampong Cham to visit Wat Nokor, a wat built within the ruins of an ancient temple which holds a timeless story. On the way back to the cruise boat, we will visit an orphanage. Along the way, we will have to maneuver a 2-kilometer rickety bamboo bridge. We will disembark after breakfast and board a coach at 08.30 for the transfer from Kampong Cham to the drop off point in Siem Reap. Our local Cambodia representative will be there to welcome you & transfer to your hotel. Today we start the visit to the famous Angkor Wat temple, Bayon Temple, Thommanon, Chau Say Tevoda, Terrace of Elephants and Leper king and Taprohm temple etc. Morning trip to Phnom Kulen where the river of 1000 lingas features thousands of carvings engraved into the sandstone rocks under the water. We also visit the Rock temple with a large reclining Buddha. There will be a picnic lunch by the waterfall. Afternoon trip to see the oldest temple in Angkor, Banteay Srei. This temple has the best engravings among all the ruins. 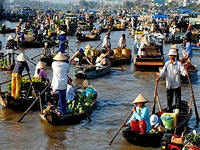 The sights and sounds of the Mekong Delta as you cruise from Ho Chi Minh City to Angkor!